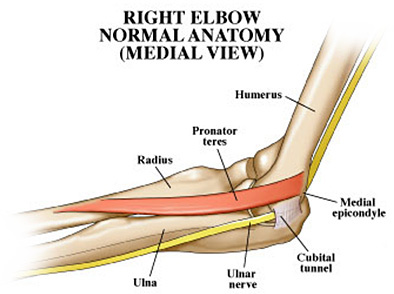 The outside bump just above the elbow where the tendons connecting muscles that straighten the fingers and wrist attach. The inside bump just above the elbow where the tendons connecting muscles that bend the fingers and wrist attach. The rubbery, slippery substance that covers the ends of bones at the joint. Healthy cartilage enables smooth joint movement and absorbs shock. One of two ligaments that connect the humerus to the ulna. 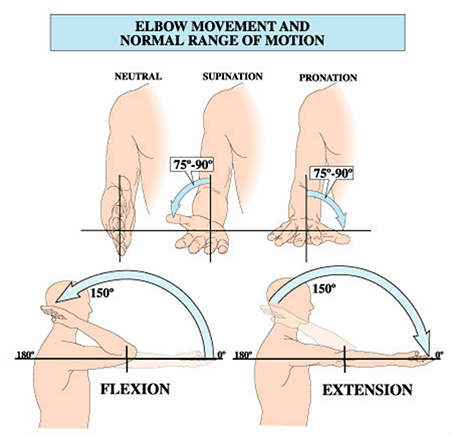 The medial side refers to the position on the inside edge of the elbow. One of two ligaments that connect the humerus to the radius and ulna. The lateral side refers to the position on the outside edge of the elbow. The ring-shaped ligament that wraps around the head of the radius and keeps it snugly in place against the ulna. The tendon that attaches the biceps muscle at the front of the upper arm to the radius that allows the elbow to bend and supinate. The tendon that attaches the triceps muscle at the back of the upper arm to the ulna that allows the elbow to straighten. One of themuscles at the front of the upper arm that allows the elbow to bend and supinate. The muscle at the back of the upper arm that allows the elbow to straighten. The main artery leading from the upper arm down to the front crease of the elbow, where it branches into the ulnar artery and radial artery.